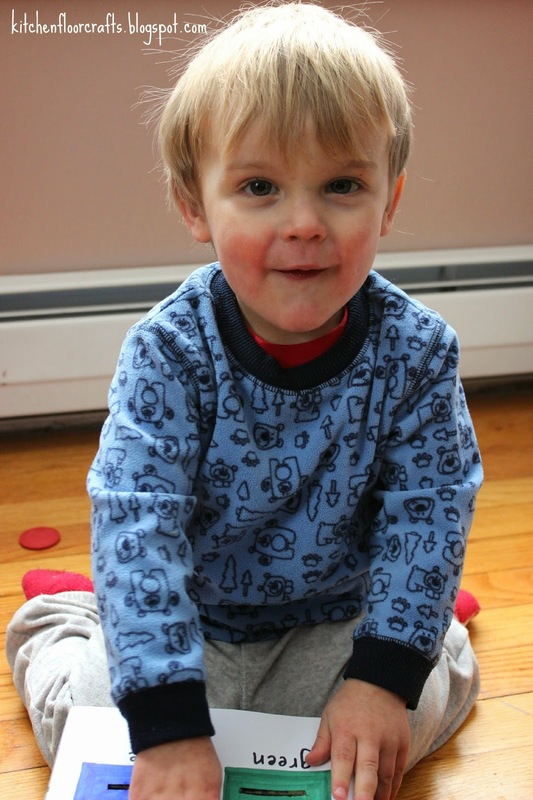 As I've mentioned before, I'm often looking for ways I can capture Little Brother's attention with a "quieter: activity. He has loved "drop" activities for quite a while now. Other drop activities we've created before include a pom pom can drop, the simple straw drop, and a big bottle ball drop. 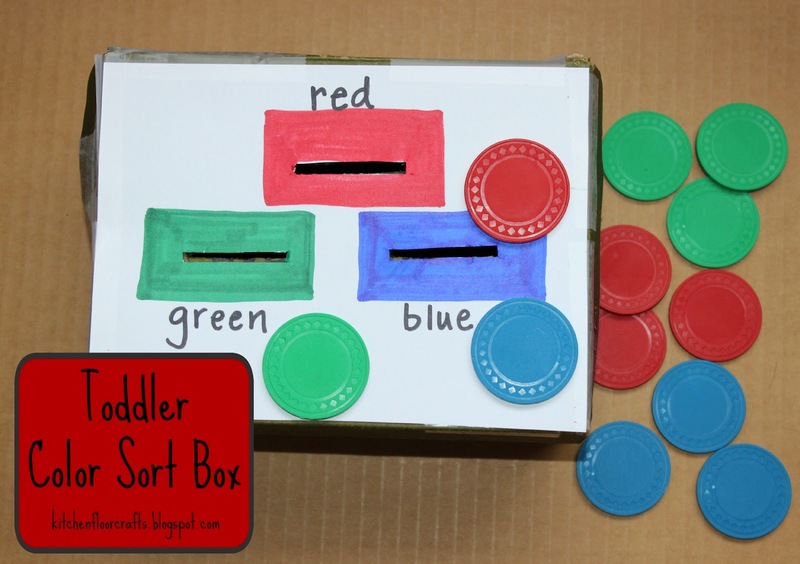 For this activity I was inspired by my husband's poker chip set (because he's not using them anyway) and a small shoe box to create a Toddler Color Sort Box. We've tried some color sorting activities with Little Brother before, including a pipe cleaner color sort, but this was our first time using three colors. The poker chips were a perfect sorting material because of their size and distinct colors. To create the box I cut three slits about the size of the chips into the lid of a child sized shoe box. 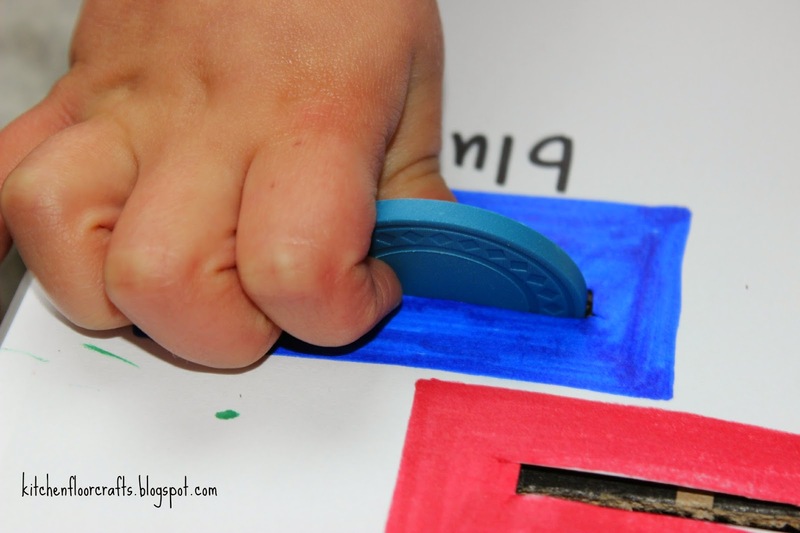 I then taped a piece of paper on top and cut the the three slits through the paper as well. I used permanent marker to draw a red, blue, and green rectangle around each slit. Very quick and easy to assemble. Our fun began. I gave Little Brother a pile of the chips. Right away he started sliding chips into the box, but not by color. 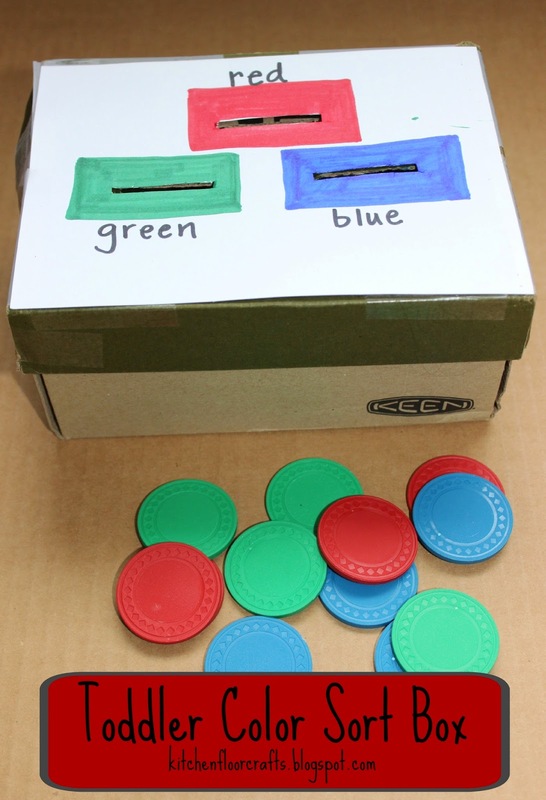 I also started to put chips into the box, showing Little Brother how I was matching the color. He started to try doing the colors as well, with coaching he started to correctly match the colors. The best part about the box is that once we put all the chips in Little Brother could easily open it up, take out the chips, and put the lid back on. As we played the first day, he definitely got the hang of the color sorting and even started to purposefully pretend to put the wrong color in each slot. 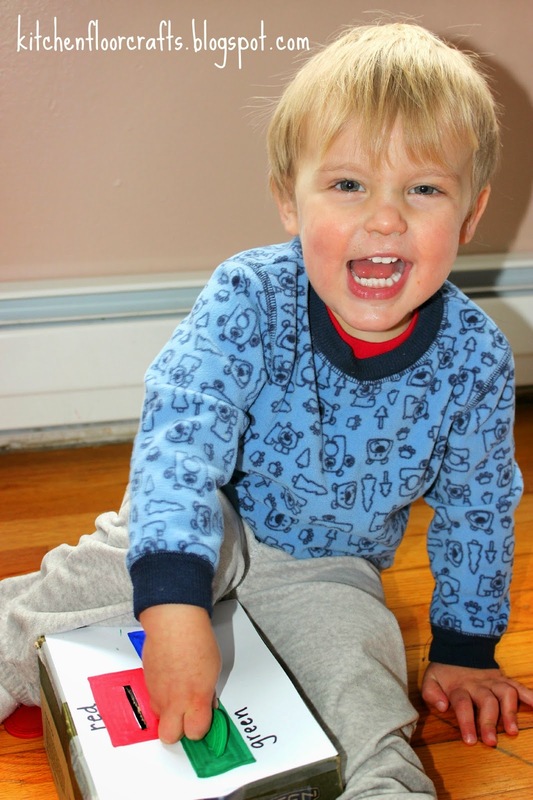 Little Brother has returned to playing with his box several times over the last few weeks. It's been a great "busy" activity as I make dinner or focus on another task. 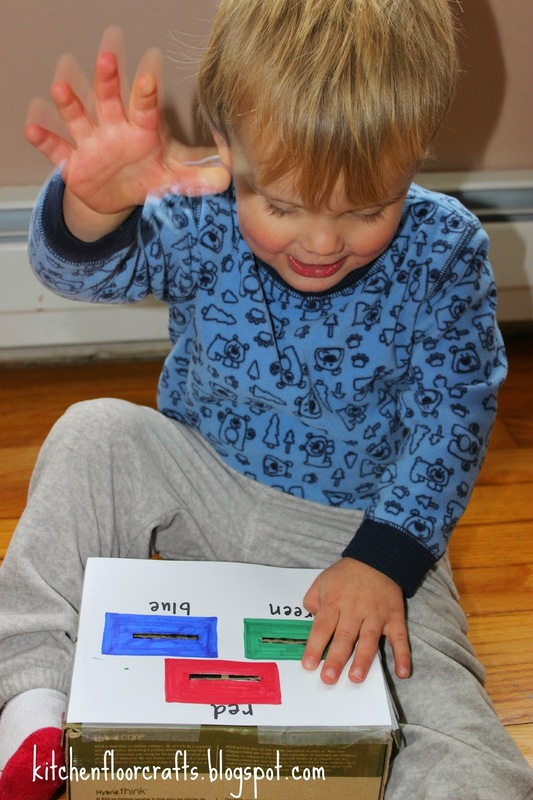 Not only does it work on color matching and sorting, but manipulating the chip into the slits also develops fine motor skills. Because he's been so interested in the box, we've kept the activity down low so he can go to it when he wants to work on it. It always makes me excited when I see him select one of these activities on his own!